A seed bead and metal bugle peyote stitched bracelet with a unique Bronze Age appeal. A Chinese coin could also be used as the centerpiece. 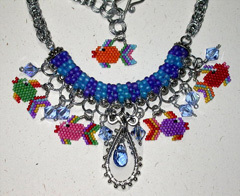 NOTE: Pattern is for fish charms only. Delica, size 11 bead color numbers listed below.